Point Comfort Freedom short term international travel medical insurance is a great travel medical insurance option for your team going overseas for a few days up to 30 days. Good Neighbor Insurance provides this great travel medical insurance policy for your organization. Remember that the biggest liability of any organization, whether it is a place of worship, faith-based organizations, student groups, volunteer groups, and any group traveling together, is not having international medical insurance that includes evacuation cover. Why do you need international medical insurance? You never know when one of your team members breaks one of their bones or contracts an illness that warrants medical attention. You want a western style medical facility that practices top notch medicine. I know! I was born and raised in a country that did not have any western style medical facilities close by. In fact, it took 4 hours to get to a ferry, 1 hour ferry ride, and another 2 hours to get to a solid western style medical facility. Of course, this was 30 plus years ago. But still, many western style medical facilities are not close by. You can call your overseas medical insurance 24/7 for a nurse/doctor on call when it comes to severe emergency situations. How sweet is that? Call one of our trained and licensed agents at 866-636-9100 or at 480-633-9500 here in Phoenix, Arizona. We can provide you more information on this great Point Comfort Freedom international team policy. Or you may go straight here at https://www.gninsurance.com/point-comfort-insurance-for-groups-traveling-overseas/. Rest assured, 20 years in business our GNI family is still excited in providing the best international medical cover for our guests, you all! It never gets old because we know that these international travel medical benefits bring you peace of mind as you all travel and serve overseas! Why do you need international evacuation insurance? Simple. It cost loads of those dollar bills to air ambulance someone to a medical facility. All you have to do is call the number collect on your international medical card and the overseas medical insurance company will handle the rest. There is no deductible or extra cost when the evacuation medical insurance needs to be used as long as the international medical insurance company is fully in charge and involved from the start. Remember, they are the experts. You paid them to make sure you are well taken care of. We have amazing trained and licensed international insurance agents here to answer any of your questions relating to overseas medical insurance. Give them a call here at 866-636-9100 or here at our Gilbert, Arizona office at 480-633-9500. Customizable benefit options for churches, organizations, and NGO’s that deploy multiple teams a year. Discounted daily rates for high volume travel groups. Easy online enrollment, extensions, and renewals on a personalized website with your organization’s name and a private group log in. Set daily rate for one year, no matter the age of the traveler. Emergency Medical Evacuation coverage up to $500,000 (with the EvacPack) is for travelers under the age of 65. Medical Evacuation is limited to $50,000 for those 65 to 79. Medical Evacuation is not available for those 80 or older. Complications of pregnancy are excluded. We recommend for individuals: https://www.gninsurance.com/geoblue-voyager-choice-essential-single-trip-travel-insurance/#excursion This policy will cover travelers for complications of pregnancy, but not for delivery. 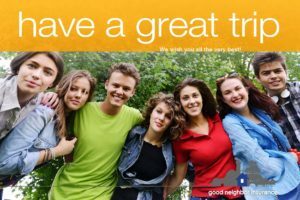 Available for only U.S. citizens traveling outside of the U.S.
We recommend for non-U.S. traveling outside of their home country: https://www.gninsurance.com/outreach-international-travel-health-plans/Please call one of our licensed agents at Good Neighbor Insurance at 866-636-9100 or our other telephone number at 480-633-9500 with any questions. Good Neighbor Insurance International Brokerage is located in Gilbert, Arizona, inside Phoenix Metro. You may also reach us via email at info@gninsurance.com. Our GNI family to yours wishes you and your family an amazing and safe travels! The Bottom Line of our Point Comfort Freedom Short Term Team Travel Medical Cover: This customizable plan with a locked-in rate provides emergency medical coverage for those traveling with your organization. Please call one of our licensed agents at Good Neighbor Insurance at 866-636-9100 or our other telephone number at 480-633-9500 with any questions. Good Neighbor Insurance International Brokerage is located in Gilbert, Arizona, inside Phoenix Metro. You may also reach us via email at info@gninsurance.com.